Seashell freshness beguiled on occasion – and a return to refreshing wine is welcome. But hard and/or dry tannins detracted. Many fine whites. This vintage should be less expensive, but careful choices required. A mixed bag. 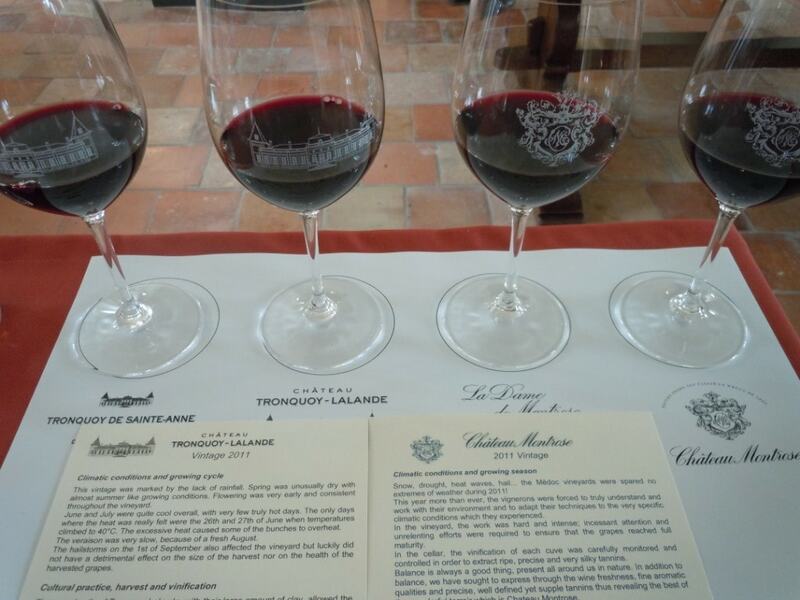 Previous posts, such as the tasting notes “posted live” from Château Branaire Ducru, were impromptu. I had since tasted some of the same wines again, at a trade tasting, non blind. As in other vintages, sample variation exists, so please take care when reading my reviews. 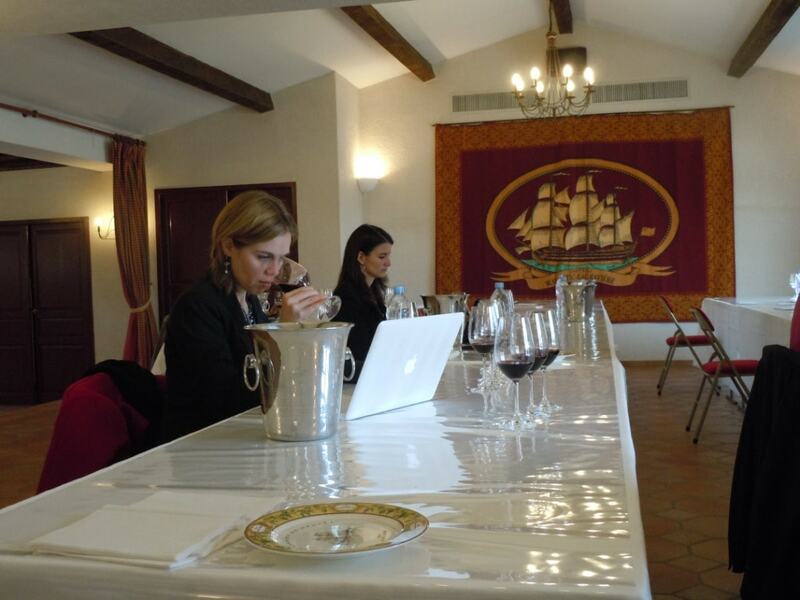 And for estates that monitor my notes: Please, take it easy… We are talking about barrel samples, after all. I convey honest impressions, based on what I tasted. But proof is in the bottle – and with age in bottle. 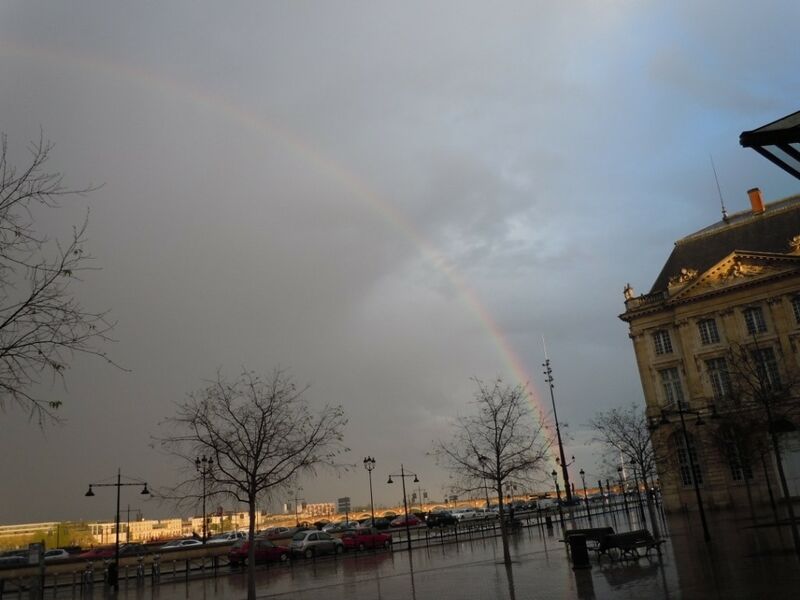 In any case, I will return to Bordeaux later this year to taste wines again – and those I had missed during en primeur week, such as Latour, Mouton, Cos, and several Pomerols, which I heard did well: l’Evangile, Lafleur and Eglise Clinet, not to mention the Moueix stable. You can go directly to my notes by clicking on the appellation links above, but a word on how “harlequin” this vintage is. First off, because of the varied weather, grape bunches did not uniformly ripen, so there is a reference to the harlequin costumes during Carnival season in Europe… Nice metaphor which I got from Jean Rene Matignon at Château Pichon Longueville Baron. See video below. Harlequin in the same sense in that quality varied as well as colors of grapes in bunches. It was rather hard to pick an appellation that did better. 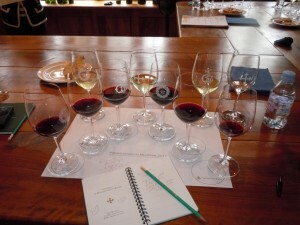 Perhaps it is safe to say that dry whites excelled overall better than dry reds. Among the reds, it is more difficult to choose. Were the Pomerols the most homogenous? Certainly Cabernet Franc did well. But Petrus seemed tough as nails: like an old school wine, I bet it will surprise many palates with time in bottle. I had a slightly harder time in Graves and in Margaux than I did in the northern Medoc, which seemed to do best in the sweet spot of St Julien and Pauillac, but throughout there were variations in quality. 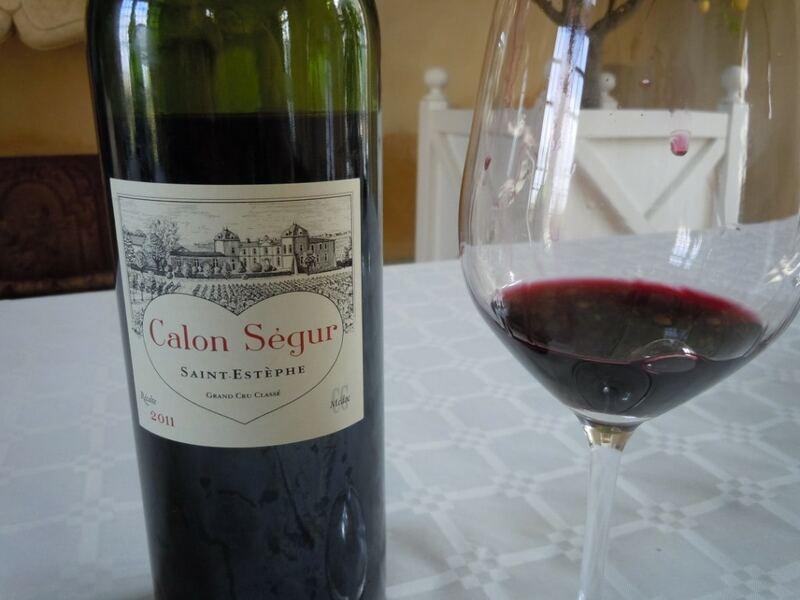 Perhaps my favorite all around Left Banker, taking price into account, is Calon Segur in St Estephe. But even many of the better wines – soft and elegant and fine mid palate presence – were marked by some “toughish” tannin on the finish. The worst had excessive dryness. It seems this was hardly a vintage where grape pips ripened well, so the key was not to extract too much from the pips, but rather from the skins. 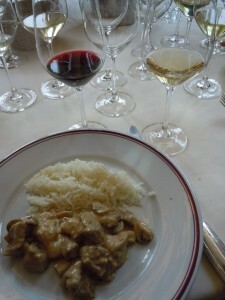 Just as in 2008, it seems to me that the whites from Gravesand Pessac Leognan did better, overall, than the reds. 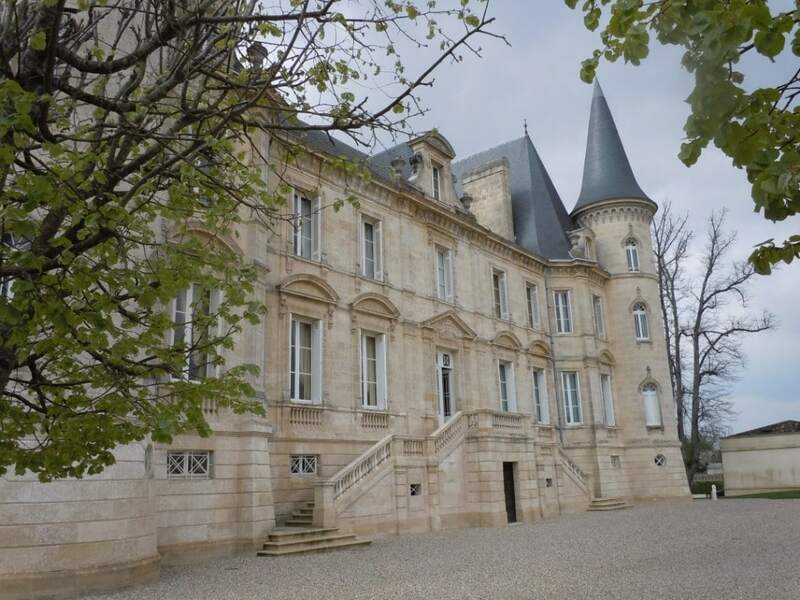 Certainly this was clear to me when I tasted at Château Haut Brion, whose reds were not stars of the vintage, such as, say, Vieux Château Certan or Calon Segur. 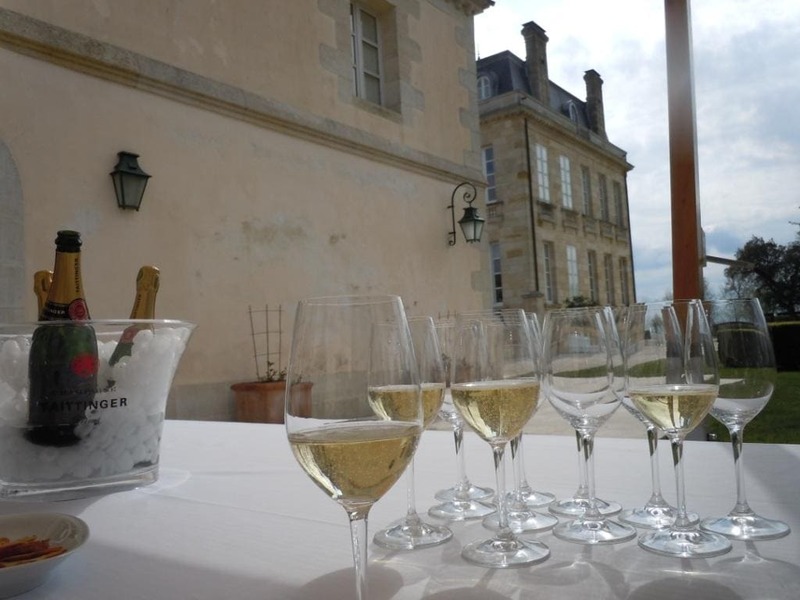 On the other hand, tasting some 2008s today from the region – as I had in a vertical at Domaine de Chevalier – many 2008s are tasting better from bottle. And in 2011, at least there was more freshness when compared to 2010 and especially 2009 in some cases. Certainly La Mission seemed more appealing to me in 2011 on some levels than it did in 2010, with its monstrous alcohol level last year. 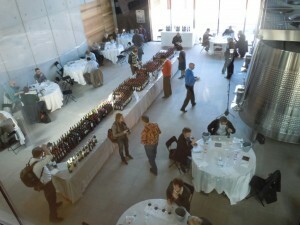 Most of the wines below were tasted blind, on the morning of Thursday 5 April at Château Malartic Lagraviere (photo above). The wines of Haut Brion and La Mission Haut Brion, also tasted that day in the afternoon, were not tasted blind. In the video below, with Jessica Harnois, we briefly discuss the variable nature of 2011 Bordeaux, and conclude that the whites were on balance, superior. Reds – flights of six. 2. Light plum aroma. Somewhat choppy texture with noticeable tannins, a touch clumsy, and ending on a slightly hard note. This is not too bad, but somewhat out of place. Check back after barrel aging. Château Latour Martillac Pessac Léognan 88-90? 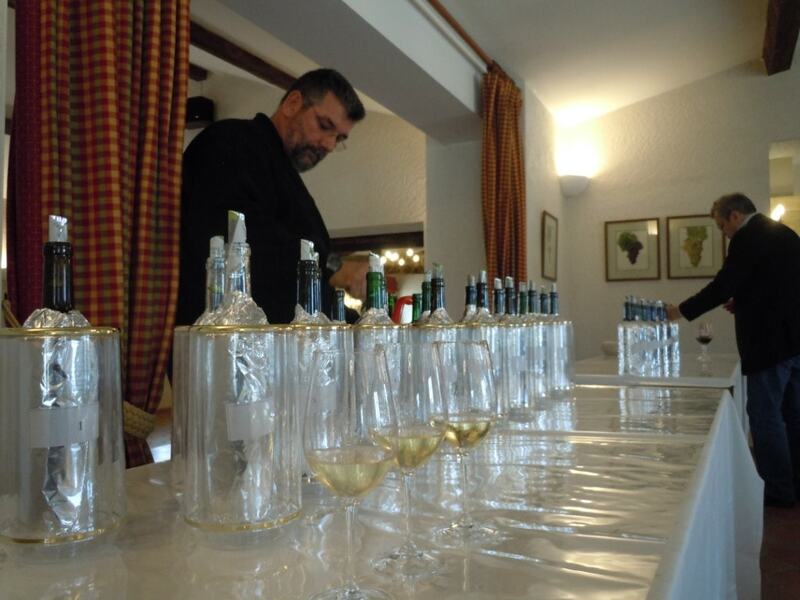 Whites – I had some high hopes….which more or less fullfilled, although not as homogenous for me as some other tasters believed. Flights of three. In the end, the whites prove more successful than the reds overall. Château La Mission Haut Brion. Tasted with Mark Golodetz, who liked this, and John Gilman, who did not so much. My opinion? Somewhere in between. Like Mark, I really appreciated the rather fruity and juicy mid palate, preceded by a pleasingly ripe aroma of dark fruit and notes of fine chocolate. Like John however, I also did not appreciate noticeably drying tannins on the finish. A second sample seemed fresher but still with dry notes on the finish. On the plus side as well, however: 13.5% alcohol and a pH of 3.63; certainly not as hard and alcoholic as the 2010. Blend is more Cabernet focused, with 55% CS, 11.3% CF and 33.7% Merlot. Only 44% of the harvest was used for this first wine. 89-92? What can I say? 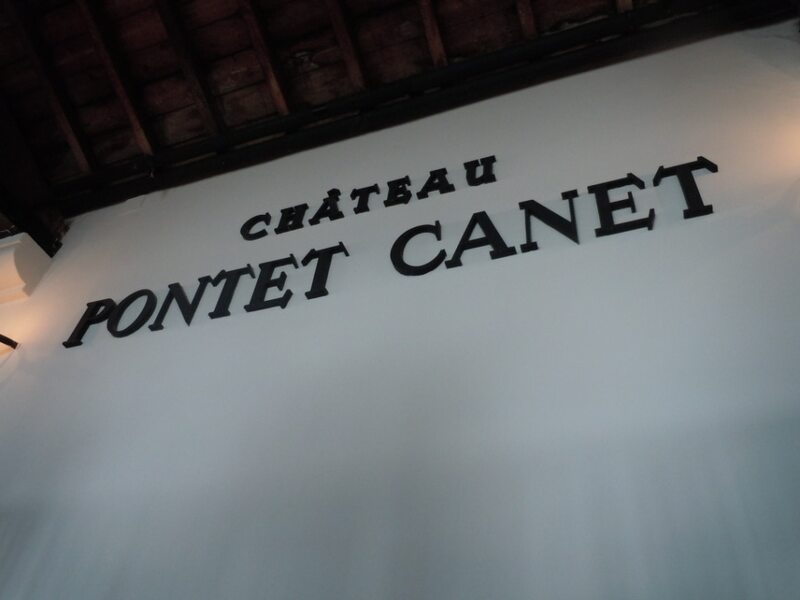 I have been sometimes underwhelmed by somewhat “over intense” richness of Pontet Canet in some vintages, but in 2011, this impressive estate managed to craft a wine with iodine freshness and purity of fruit, plus underlying Pauillac power. This, in a vintage often marked by hard and/or drying tannins, none of which appeared in Pontet Canet, making it one of the wines of the year. 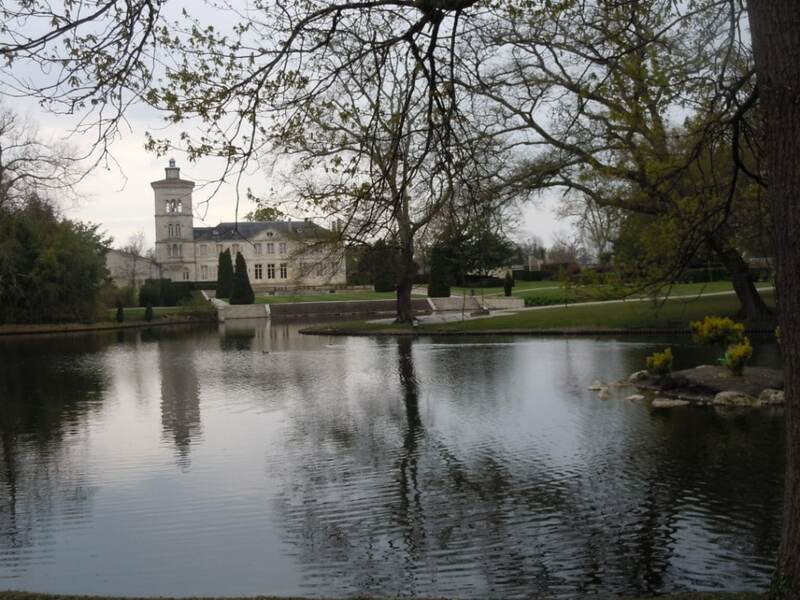 Of course Lafite Rothschild was impressive. But in a classical, backward sort of way, with some austere tannin on the finish. 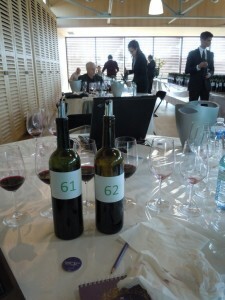 The 2009 and 2010 were noticeably more impressive in that sense, although the aromatics of the 2011 are excellent. Of the three first growths I did try (Haut Brion and Margaux were the others), Lafite Rothschild is my favorite. Several other noteworthy performances included the best Lynch Moussas I recall ever trying en primeur, particularly fresh and tasty. 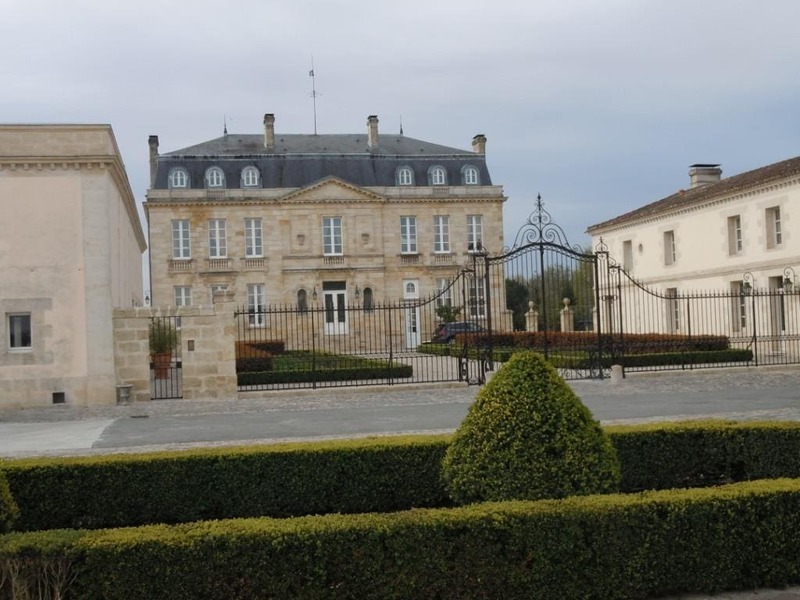 Grand Puy Lacoste and Pichon Longueville Comtesse de Lalande put in fine showings, as did Pichon Baron. So did Batailley. Many of the Pauillacs I tried were quite impressive. But Pontet Canet seemed to wow me the most this year. Tasted blind at Chateau Branaire Ducru, 4 April, and, when noted, at Chateau Lagrange, trade tasting on 5 April. Château d’Yquem. First tasted in Bordeaux on Wednesday evening at a fancy to-do organized by LVMH. 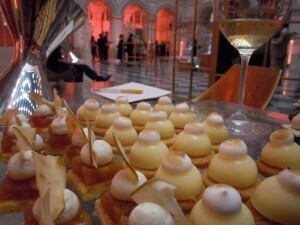 The appetizers were prepared by a famous chef, and they were astoundingly good, from lobster to foie gras. We also had the 1997 to drink after tasting (and, honestly, drinking) the 2011. Yes, drinking it. The 2011 far overshadows the 1997 because it has far more verve and energy. 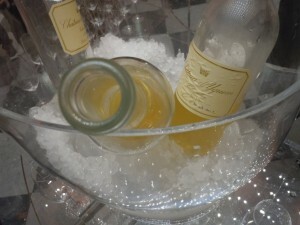 The seashell freshness of 2011 served Sauternes particularly well. Paired with fine botrytis spice and expected richness? A recipe for likely wine of the vintage candidate. 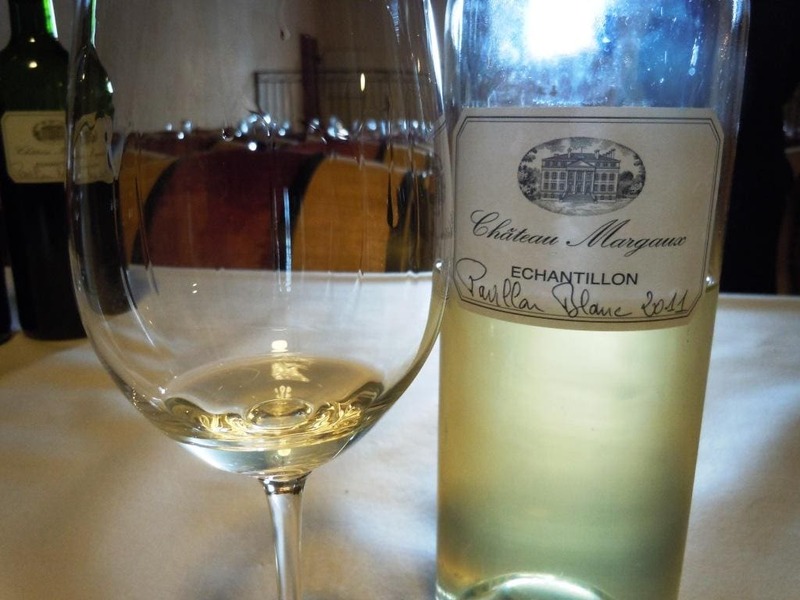 For such a prenatal Sauternes, the aromas were already very promising, ranging from fresh, iodine and salt, by way of white apricot and a basket of summer fruit, to botrytis-derived spice aromas including nutmeg and black tea. The attack was brisk, before the mid palate is treated to opulent textures, fairly enveloping your senses. Why is this so good? 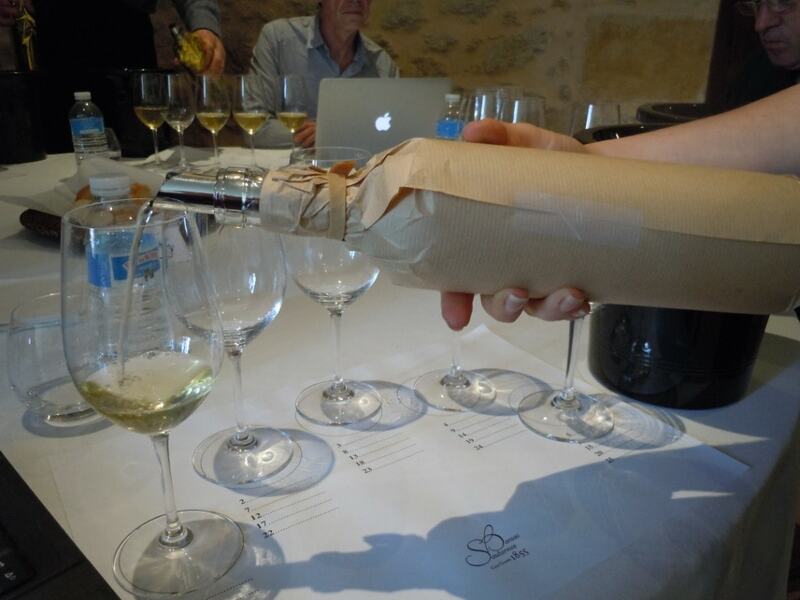 Sauternes and Barsac tasted blind, at Château Coutet, 2 April – with some tasted again, non blind, on 4 April, at the trade tasting at Château Kirwan. 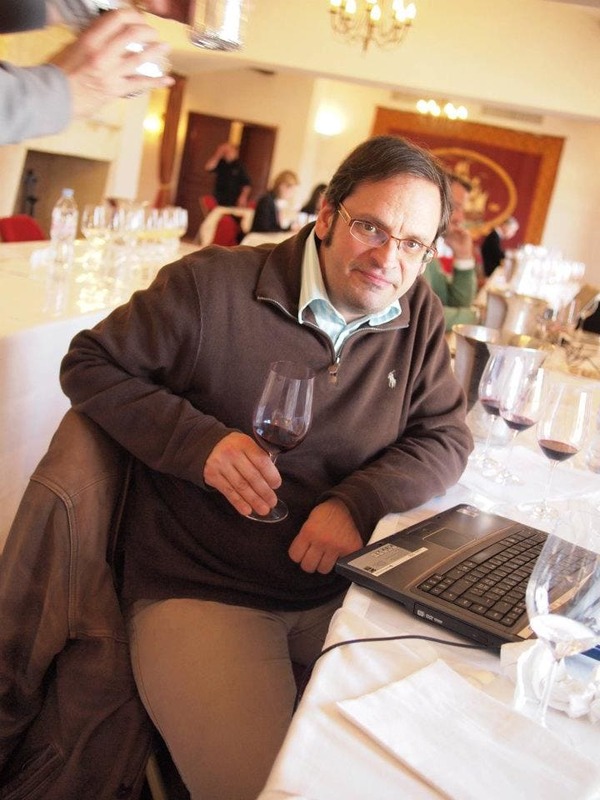 In his annual harvest report, Denis Duburdieu calls 2011 an exceptional vintage for the sweet wines. Based on my tastings, I would say that it is rather good to excellent. Some wines showed too much softness. But what makes it special is a certain verve and freshness in the better samples that, when successfully paired with nuanced richness, yielded fascinating tastings. Château Broustet. Somewhat generic nose, but the palate (and nose) is pleasing overall. Has substance on the palate but a bit stolid and slightly warm… there is flavor though. 88-89? 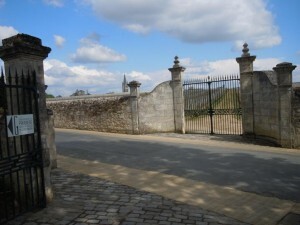 Château Filhot. Some people really liked this, this year. Based on my sample, this has canned fruit elements. Reach for the water. Should try again. Note reserved. Château de Fargues. Cloying pineapple on the nose. The palate is rather simple. And slightly warm on the finish, to boot. Ouch, that was my blind tasting note. While not quite as harsh at the Kirwan trade tasting, when I tasted it again, I have to say that, for its terroir and breed, it compares poorly to wines like Doisy Daene or Doisy Vedrines, which have far better freshness… 87-89? Château Sigalas Rabaud. A bit monolithic, if rich. Rich texture on the palate however, if a touch sugary. Not sure this is the most balanced Sauternes I have had. 87-89? 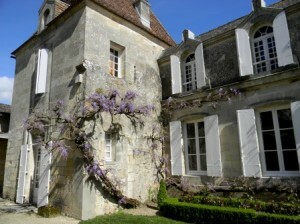 Château Guiraud. Blind tasting showed a peppermint nose, and follows through on a peppery palate. Lacked a bit of verve… but has flavor. Much better sample at the Kirwan tasting. Because of conflicting impressions, note reserved. Clos Haut Peyraguey. Melange of mineral and fruit? Reduction. Palate is a bit broad… lacks verve. Not as interesting as the next two, but conveys some fruit. The sample at the trade tasting was better however. Note reserved. 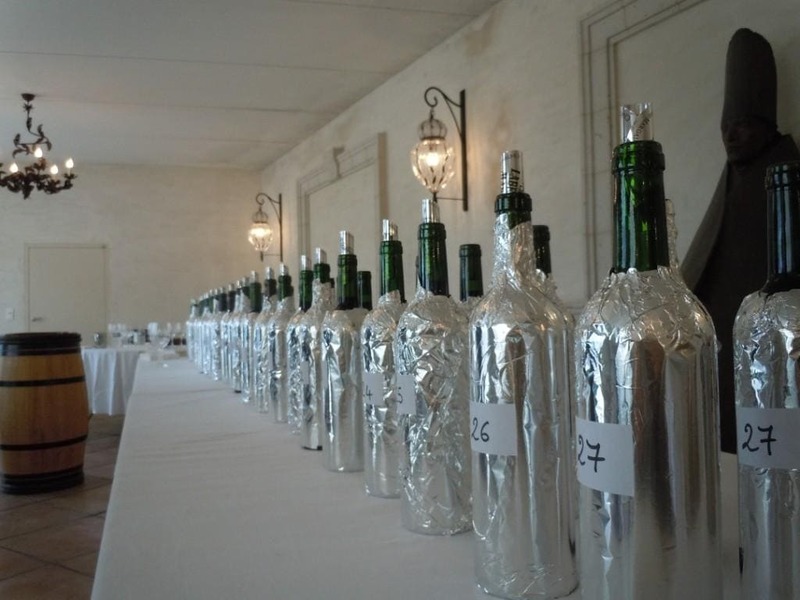 Most of the Northern Medocs – 35 in all – I tasted blind on 4 April at Chateau Branaire Ducru, in Group 5 of the UGCG journalists. The exuberance with which I had tasted these wines blind subsided just a bit, when tasted non blind at Chateau Lagrange the next day at a trade tasting. However, impressions for some that I liked (and some that I liked less) were more or less confirmed at the trade tasting. 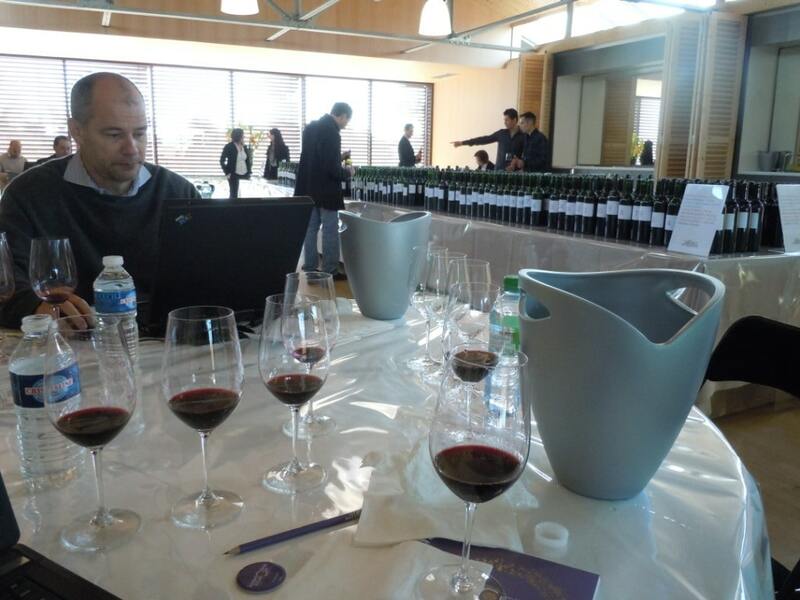 As you can read for Pauillac and St Julien, the Northern Medoc included some of the finest red wine samples of 2011. 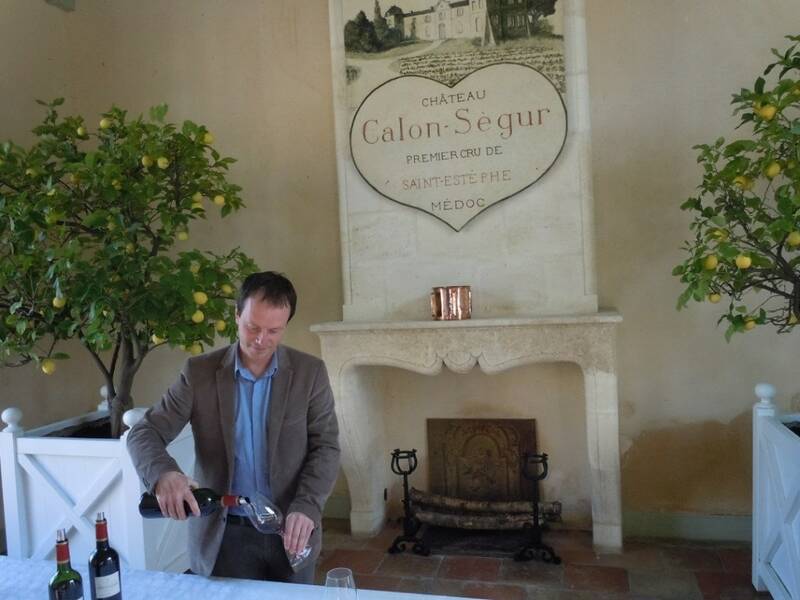 Among the Saint Estephes, Calon Segur remains the most impressive, although Montrose is noteworthy, very classical – and more expensive… Vincent Millet of Calon Segur told me that they had not suffered from hail and that their yields were rather high, about 42 hectoliters per hectare. Quite high for the 2011 vintage, considering that a wine like Chateau Palmer in Margaux had barely half those yields, to take one example. Montrose? Closer to 35 hectoliters per hectare. Another advantage in St Estephe, according to Millet, were that the colder clays kept the subsoil more humid than the gravels during much of the arid growing season, so that Cabernets grown on clay actually were able to mature better… because they did not suffer as much from the dry conditions. I did not taste Cos d’Estournel, but plan to visit and taste later this year, so stay tuned for updates. 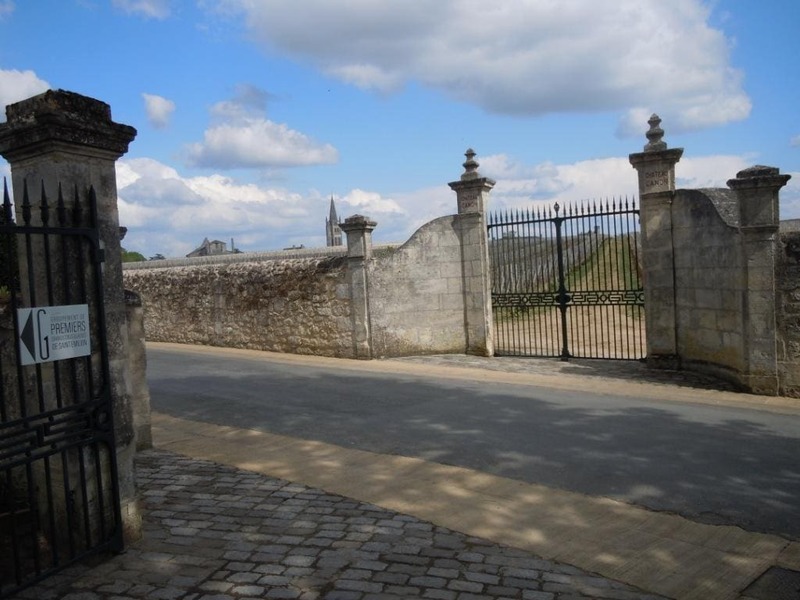 Chateau Phelan Segur . Slightly dumber nose. Here we have a more substantial palate, which is promising. 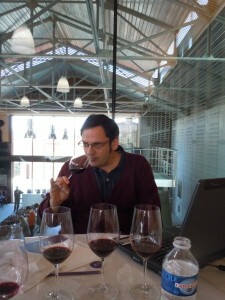 Just a touch hard on the finish, however, compared to the preceding wine, tasted blind. Lacks some richness of fruit. Confirmed at trade tasting, a bit tough. 88-90? Chateau Cos Labory. Bit more oak derivation? Good fruit on the attack, with fine core of brightness on the mid palate. 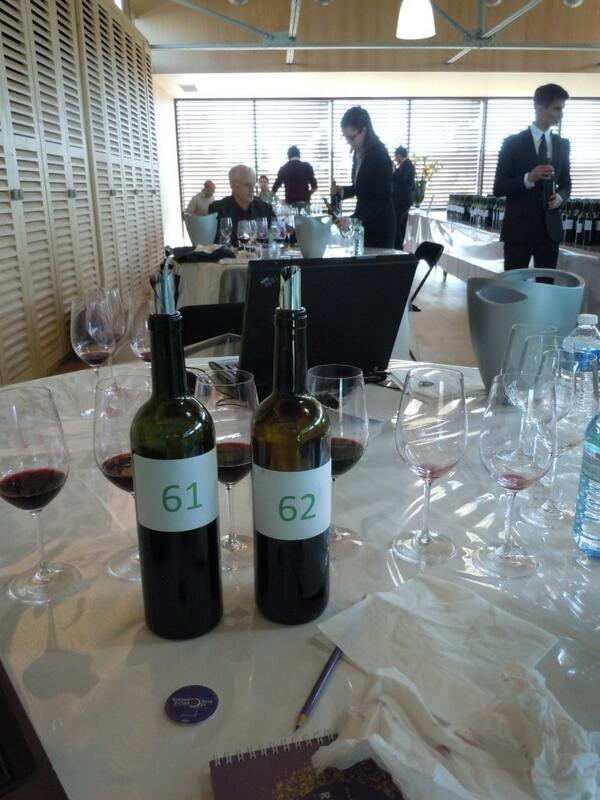 The palate does seem to have more evident oaky tannins, however, some drying, too… on the finish. Need to re-tasted, because this estate is not known for over oaking. Judgment reserved. 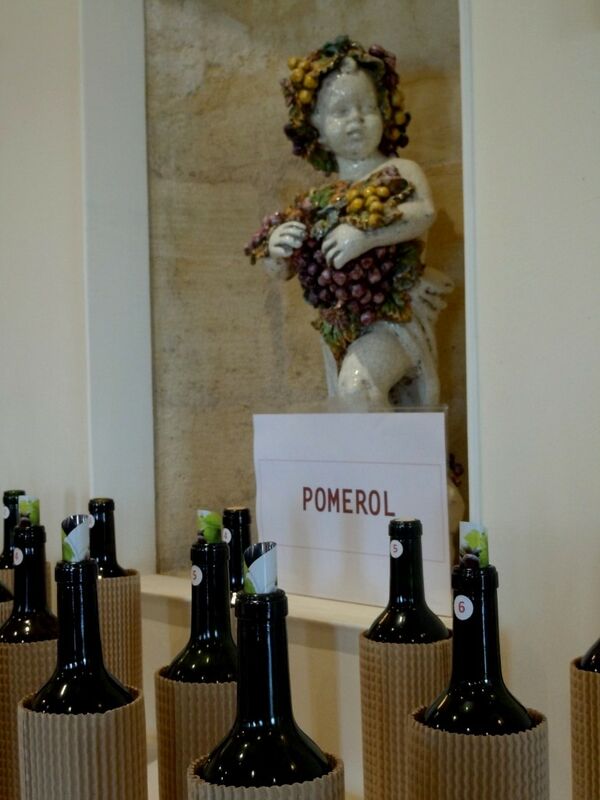 It is tempting to say that Pomerol was the most homogenous of the red wine appellations tasted. Why? 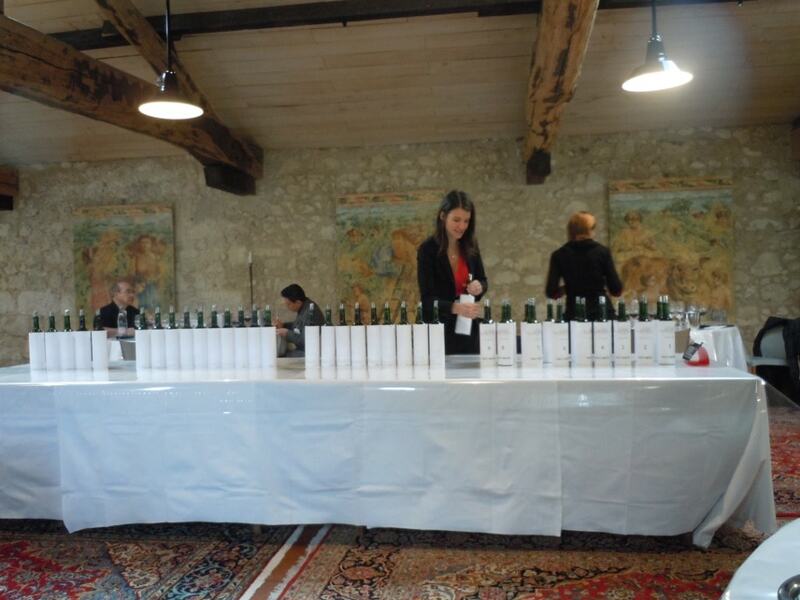 First off, it was the most successful appellation at the rather difficult Cercle Rive Droite tasting on Sunday 1 April. Second, it seemed to have some of the juiciest wines. Third, it is what I often heard from other tasters. Then again, I did not taste the Moueix stable, something I need to do in a subsequent visit. And Petrus, while impressive, did not exude a wow factor in 2011, which is not a good sign for the rest of ‘em, no? Château La Cabanne. Somewhat less expressive nose, but fine. A darker fruit profile, skin tannin extraction… like a tea bag? Rather mute at this stage. Not normally a wine I seek, but the overall impression I get is of not making offense, and not leaving much of an impression, either. May fill out better over time in barrel. 88-89? Château Petit Village. A “made up” nose, not as interesting, vanilla like. Palate is sur le fruit rouge. Not bad, but something diluted about this wine. Perhaps it was the sample? Note reserved. Château Clinet. Reduced nose, on several samples… Palate is broad, but marked by some oak-derived tannins, and thus a touch drying tannin on the finish, but the sap is there, on the mid palate. 88-90? Château Lécuyer. Nose is interesting. Sap comes through, but cloaked in oak…. With a rather astringent finish to boot. Not sure about this one… 86-88? Château Bonalgue. There is alcohol and drying on the finish, although with some sweet juiciness on the mid palate. I worry about the finish, however. When tasted earlier, non blind, did not impress me much, either. I usually like this wine… not so good in 2011. 86-87? Château La Clémence. Somewhat gum-staining sample, but not harsh. Did I contradict myself? Still, there is an extracted feel to this. Not bitter, mind you, but not smooth, either. Could do with more finesse. A touch hot on the finish. Not sure about this one! 86-88? Château Taillefer. Drying, not aggressive. But oak derivation here, too. Not sure… 86-88? Château Montviel. Some bacon fat on the nose, with even a hint of Syrah pepper. There is a larger scale to this wine which will win Rhone friends and influence people, but not my style of Bordeaux. 85-86? 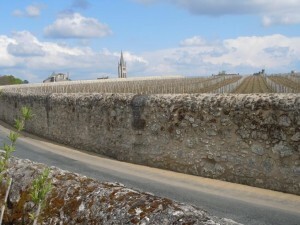 Often St Julien is the most consistent appellation. Could it be because it has the highest concentration of cru classés? 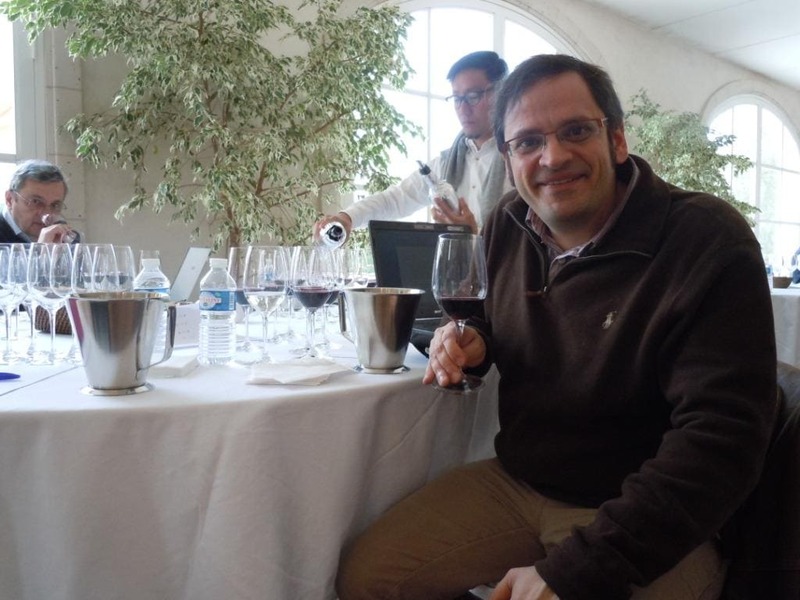 During a vertical tasting on the evening of 3 April at Château Branaire Ducru, owner Patrick Maroteaux reminded us about that. I found fine efforts from the St Juliens I tried, both blind and non blind, although one estate was missing: Château Léoville Las Cases, which I plan to visit and taste later this year. In any case, while most of the estates pleased my palate, I did not get a super star factor here, as I did in other appellations. Close, perhaps, came Ducru Beaucaillou. Château Ducru Beaucaillou. Visited the estate on Wednesday 4 April with Adam Lechmere of Decanter. 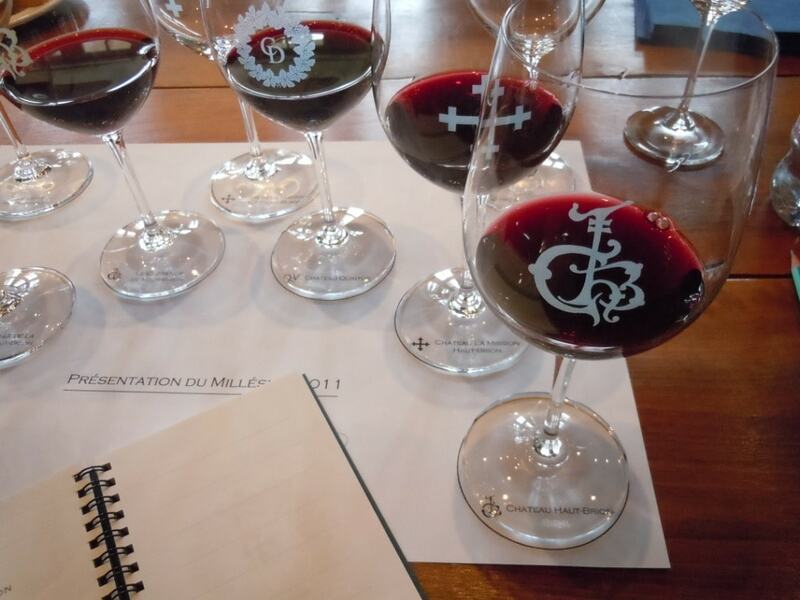 We were guided through the wines – which included a fine Château Lalande Borie and a decent enough Croix Beaucaillou – by Tracy Dobbin, whom I had met before at some other event but cannot still remember where (or when). She was very informative and it was an excellent tasting experience. 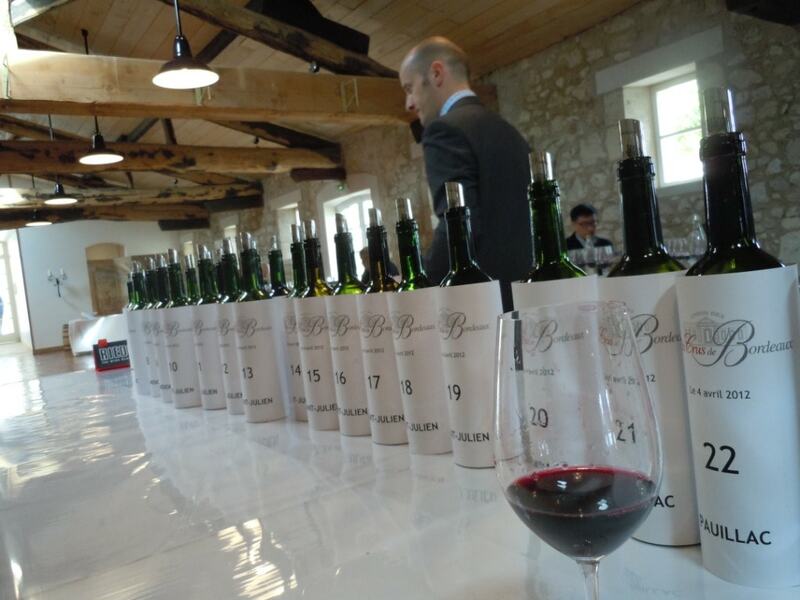 Château Lalande Borie was a real pleasure to taste, fresh and robust, if a touch drying on the finish (89-91). 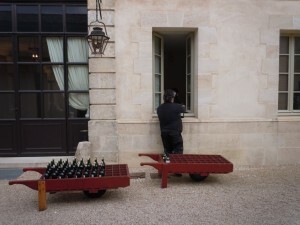 The next wines are listed in the order of a blind tasting at Château Branaire Ducru on 4 April, and, when noted, at a trade tasting the next day, non blind. I was impressed with a general positive level of quality. 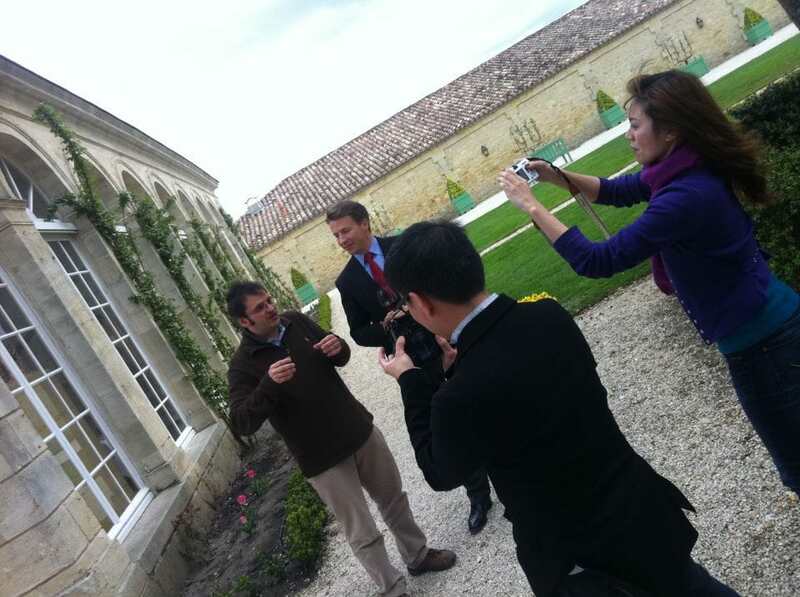 At Château Margaux, I met Thibault Pontalier for the first time, as he welcomed a group of Chinese wine buyers and journalists. A fine presentation of the estate, with many interesting questions about current trends in the Chinese market. As for the wines, I have to say that I was not that impressed with the first wine, reminding me a bit of the 2008 when tasted en primeur. Yes, very low yields – 29 hectolitres per hectare – and of course the usual superb care in winemaking, but there was a touch too much austerity overall… I was left wondering if the 100% new oak was really necessary in this vintage, because I noted some slightly drying tannin on the finish. In fact, I rather preferred the second wine, Pavillion Rouge, aged in 50% new oak, and displaying more sap and energy on the mid palate. Unlike, say, Lafite, which seemed merely foreboding, Margaux seemed more drying. Not a good sign, but let’s give it some benefit of the doubt… and wait to see how it tastes from bottle. 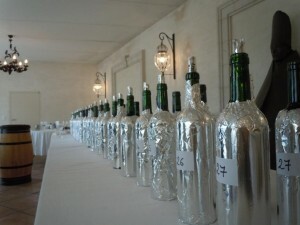 In the meantime, I plan to taste a mini vertical of Margaux next time in Bordeaux, including 2007-2008-2009-2010. Whatever the case may be, the white stole the show. The 100% Sauvignon Blanc was at once substantial, rich and filled with verve. Thibault remarked that it is the best white since the 2007. I never really liked the 2007, with 15% alcohol, which reminded me more of an Alsatian Pinot Gris. 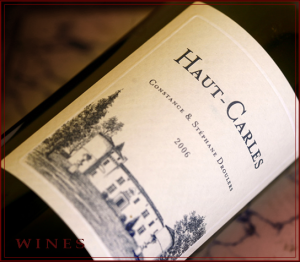 The 2011, however, at 13.1% alcohol is truly classic white Bordeaux: seashell freshness, substance on the mid palate, and a long finish. One of the best whites from 2011 comes from the Medoc. A tale of two Medocs: Surprisingly good Greysac! 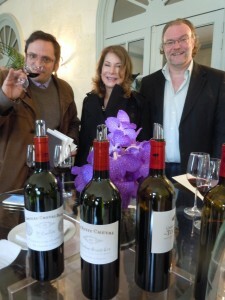 Finally, we were able to taste Chateau Marquis d’Alesme Becker, which was not part of the blind tasting. We tasted the 2009, 2010 and 2011. Lo and behold, here the 2011 was the best of the three. The explanation may be the most careful attention to the vineyard and to the winemaking ever at this often underperforming estate. I did not take notes, but recall enjoying the 2011 quite a bit. CERCLE RIVE DROITE TASTING – Satellite appellations of Fronsac, Canon Fronsac and Lalande de Pomerol. 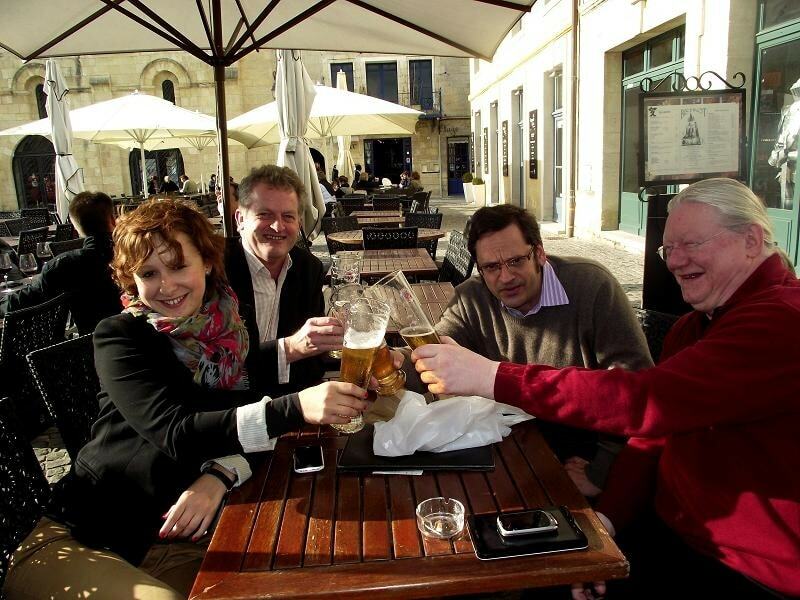 Not very easy going with Canon and Canon Fronsac, slightly better with Lalande de Pomerol….Now, the photo below was not taken after my tasting at Cercle Rive Droite on Sunday, but rather on the following Friday afternoon in Saint Emilion. But it could have been just as well. Many of the Fronsacs and Canon Fronsacs and Lalande de Pomerols were marked by hard and/or drying tannins. After all that, a beer is welcome. I noticed more the structure than the ripeness. 2009 is not 2011… But there were occasional decent wines that will not be expensive, so read on, and be choosy. 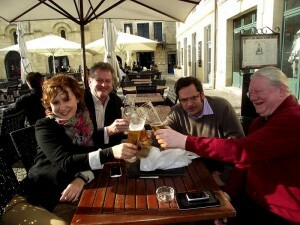 Refreshing beer after tannic red wines? YES! 40 Vanillin from the oak on the nose. Modern style. Not bad in that sense. Ripe. Somewhat monolithic. But I could see why this might please some palates. Château de Carlmagnus. 41. Freshness and ripe black fruit. Nice nose. Palate is smooth, too. Tonicity on the finish. 89-91+ Lovely. Haut Carles. This is the one that Jürgen Steinke of the Grand Jury Europeen shared with me before I knew what it was. A revelation for the vintage and a wine to buy, if the price is right. 44. Here we have more sap. Somewhat vegetal? A bit drying on the finish. 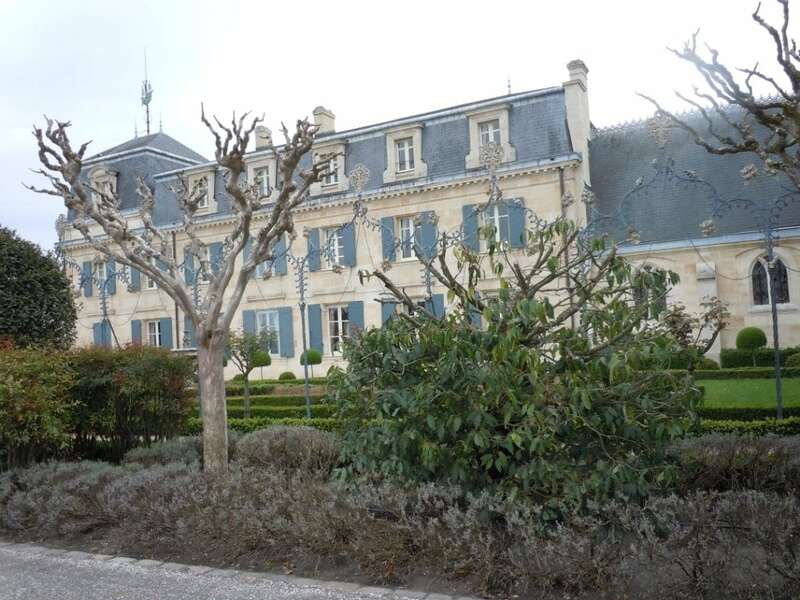 85-87 Château Dalem. 52. Is there just a bit of superficiality here, like many others, of oak-derived sweetness, making up for vegetal aspects? Here however, the palate is better, contains a pleasing juiciness, although dries somewhat on the finish. But hardly the worst of the lot. Perhaps it will develop nicely in bottle. 86-89 Château Fontentil. 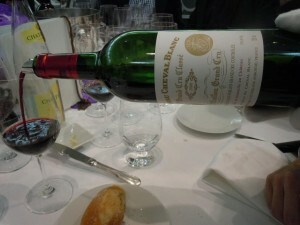 A 2000 vintage Cheval Blanc for lunch later in the day, Friday 6 April... the 2011 is not too far behind in quality. Let’s just start things with the best wine I tasted of all the Saint Emilions (did not try Ausone this year): Château Cheval Blanc. 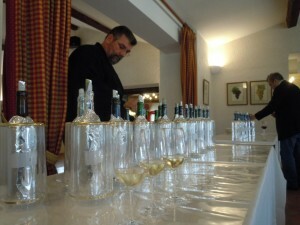 Even the second wine bested some first wines from the premier grand cru classé category. Why? 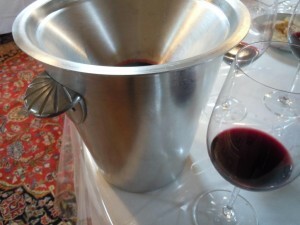 Pickings were relatively early to maintain freshness, extraction levels were soft-soft-soft, malolactics were done in tank – not in barrel, and – above all else no doubt – the Cabernet Franc on the unique gravel/clay terrain of this estate did extremely well in the rather coolish summer of 2011… The longer hang time of the vintage served this variety very well, but when grown on the Cheval Blanc terroir in particular. Ah the Right Bank! 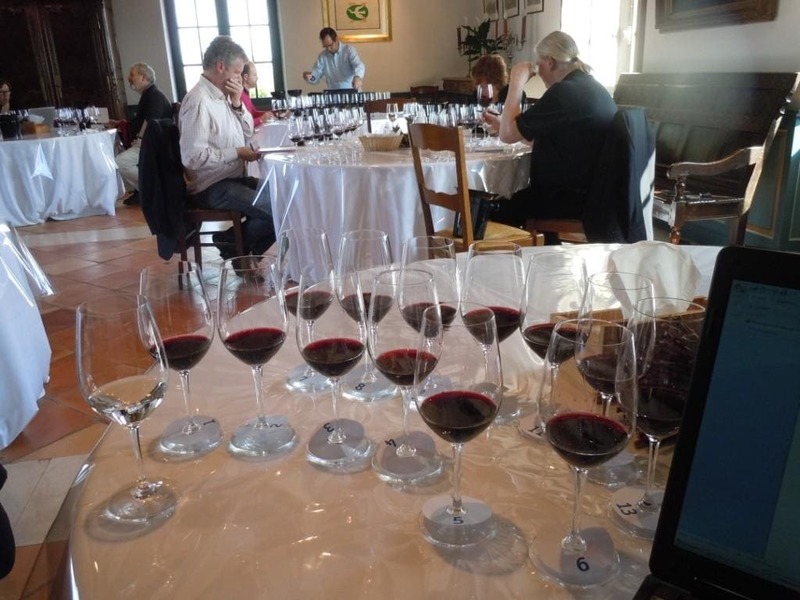 Merlot was decent enough, but Cabernet Franc did particularly well – as you just read above with Cheval Blanc, but also in Pomerol, with the fabulous performance of Vieux Château Certan. However, for some reason, I detected more cotton-mouth feelings after tasting many St Emilions than I did from wines on the Left Bank or from Pomerol. I really do not know why. Some posit that too many winemakers tried to extract rough tannins from unripe pips. That could be a reason. Perhaps it was the time of day I tasted? The samples? My personal mood? Whatever the reason, there were drying and tough tannins in St Emilion. 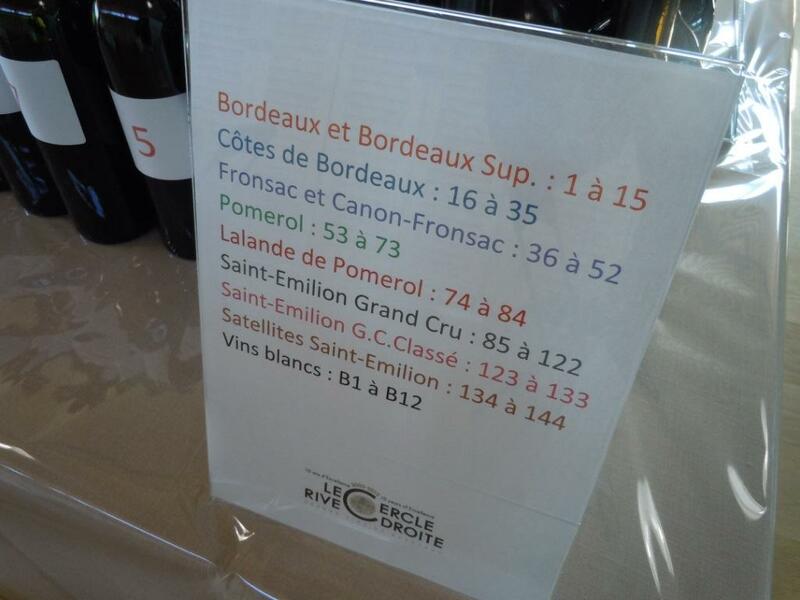 It was a particularly tough tasting at the Cercle de Rive Droite (video, above), although I encountered a bit more success whilst tasting St Emilion Grand Cru Classé blind at La Croix de Gay in Pomerol. 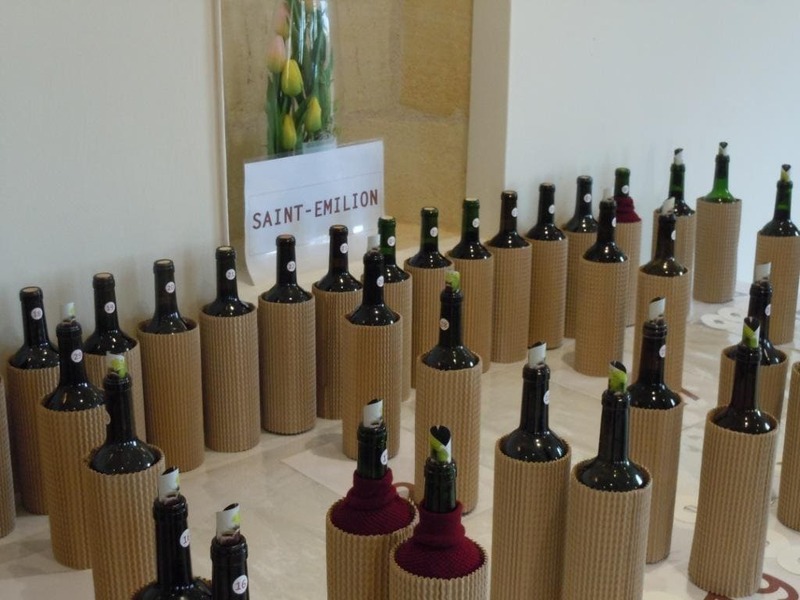 But, overall, Saint Emilion challenges in 2011, including some of the grand cru classés and even some premiers, tasted blind as well at Château Canon. 104. Touch of vegetal here. And oak derivation, but there is also a freshness, rather incongruous to some extent – a tonicity. But it does not save the day. Dries out. Chateau de Pressac. 85-87? 109. Decent sap and freshness, fruit is there, too. Tannins are present. Young Bordeaux, and rather successful here! 87-89 Chateau du Parc… Dr Alain Reynaud should be saluted here. 115. Some red fruit on the nose. Attack is decent, with a moderate intensity of flavor that is short on the finish, but not too drying. I needed no water after trying this one, at least. OK. 86-88+ Château Rol Valentin! 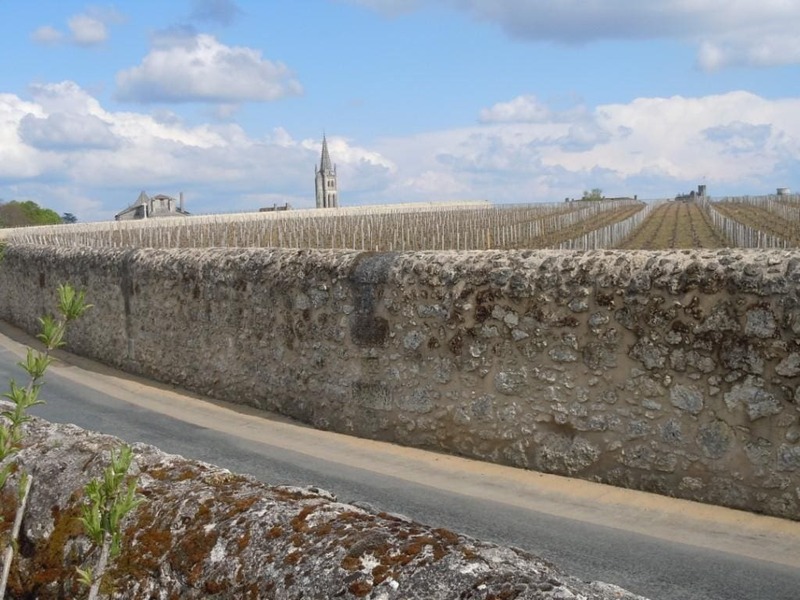 Saint Emilion Grand Cru Classé – slightly better than the grands crus. Slightly. I tasted the premiers grands crus just after tasting Petrus, which was rather hard… yes, it had the depth, the layers, but a “do not mess with me now” aspect. I recall a wine merchant in Arlington who told me that Bordeaux en primeur used to be tough as nails. This is a return to classicism. Alcohol level is still something like 13.5. But … tough as nails. I have to say that the CF of VCC was more pleasurable… as was the Cheval Blanc 2011. See my Pomerol notes. Château Trottevielle. When tasted with the other premiers grands crus, this was rich and alcoholic on the nose. With some Cabernet Franc mint however. The palate had succulence on the mid palate, but then dried out, rather intensely, with oak derivation…. I reached for the San Pellegrino. MODERN, I thought. But what a strange contrast with the experience I had had tasting this earlier this morning which indicated sample variation. The sample I had tried that morning displayed a lovely nose. Light and elegant fruit on the second nose. Showed a bit of glycerin. The palate displayed civilized tannins, a bit of a soft touch. Could it lack a bit of corpulence? Perhaps. But let us see how the barrel aging will fill it out. Positives? Freshness and even floral aspects. Lovely. Which sample to trust? Note reserved. Château Troplong Mondot. More oak on the nose. Palate is also oak derived if polished. Teeth staining, too. When tasted earlier in the morning at La Croix de Gay, it displayed very interesting black fruit nuances on the first nose. But oaky overall, with drying tannin. What is happening here?? 87-90? Château Beau-Sejour Bécot. At Canon, slightly hard and drying tannins, a bit of a cotton-mouth impression. Earlier blind tasting, a bit cedar first nose. Second nose displayed more wood than fruit. Palate is fresher however, but lacks a bit of corpulence. A bit of a disappointment here. But a second sample was a bit better, a bit fresher. Still, there is some drying. 87-91? 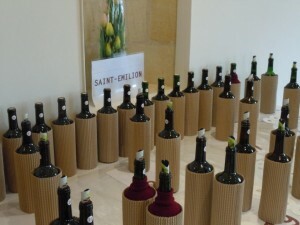 SAINT EMILION TASTED AT LA CROIX DE GAY – Here Saint Emilion wines tasted the morning of Friday 6 April. 10. Less interesting, oak-derived it seems. And the palate is marked by hard tannins. Second nose displays darker fruit, but flatter certainly than the preceding wine, not as much lift. Disjointed. Freshness, but austerity. 87-89 Château Franc Mayne. 24. Darker fruit but also fine. Yes, dark fruit and some vanilla aspects. Rich palate, could it use more freshness? Perhaps. As much as I liked the mid palate, it dries out on the finish! Reached for the water. Château La Dominique 88-90? 28. Ripe and rich… with overripe aromas of 2003 raisin. Very pleasing mid palate, almost raisin overripe once again. Not sure about where this one is going! Château Larcis Ducasse 87-89? 29. Closed nose… Reduced… hard to evaluate this sample. Another sample was more filled out. Not bad, but a touch dry on the finish. Leaves me with more questions than answers. Château Grand Mayne 88-90? Still: one of the best Malescasses I have had in a while! Nice job, Panos. You have obviously done a ton of work. A few questions – how does this vintage stack up with the likes of 2008, 2001, 1999? Also, when you say ‘seashell freshness’ do you literally mean there are notes reminiscent of seashell, as one gets in Chablis? Thanks for the notes – I haven’t tasted 2011s yet so I am glad to have your notes. Cheers! Hi Alan, thanks for reading. I think 1999 is a softer vintage, with less tannin, but more charm. This is on a general level of course. Take Margaux 1999. Rather soft and friendly, while the 2011 is more austere. Generalizing of course. 2001 is like 1999 but with more structure and length overall – a better vintage in general, and I would say – on balance – superior to 2011, although for the whites, it can be a closer call. 2008 strikes me as the most comparable among the vintages you mentioned to 2011. Some high points in different regions, some estates excelling, but marked by a certain roughness in the tannin, and some dryness, too. By seashell freshness, I mean – in part – like the iodine one does get from Chablis, yes. I like that in my Bordeaux, too. But it is never as obvious as in Chablis, more a suggestion than an in-your-face maritime sea breeze that Chablis can impart. 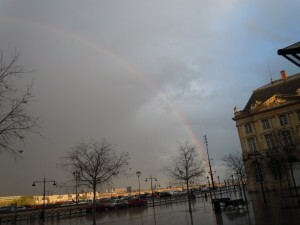 Too often, the high alcohol, big styled wines of Bordeaux lack that freshness. Because 2011 was by its nature relatively low in alcohol – compared to 2010 and 2009 – some estates beguiled with that seashell freshness, when they also managed to have smooth and ripe and juicy tannins. VCC, Pontet Canet, Calon Segur are three very good examples.